ALAMEDA, Calif. --Raiders coach Jack Del Rio softened his stance a bit on the hit that knocked receiverAmari Cooper out of the game with a concussion and sprained left ankle in the second quarter of Oakland's 21-14 win over the Denver Broncos on Sunday. "In looking at it, in being honest, I think Amari did duck his head as the guy was approaching," Del Rio said of Broncos safety Darian Stewart. "That makes it a little harder on the defender. That was probably the one piece that I didn't have access to prior to that comment. The reality is, it's harder to be a defensive guy when the offensive guy is ducking his head. That makes it a little more complicated." Cooper was running a slant pattern from the right side to the middle of the field on a ball thrown high by Raiders quarterbackDerek Carr when Stewart arrived. Stewart was flagged for unnecessary roughness on the play. After the game, Del Rio took exception to Stewart hitting Cooper in the head and neck area. "It was a vicious hit," Del Rio said at the time. "The kind we're trying to remove from our game, quite frankly. You see less and less of those. I'm sure the league will take a hard look at it. Those are the kinds of impact hits that don't need to be a part of our game right now. The guy is clearly defenseless and got targeted right in the head. There's a chance to hit in the strike zone and be somewhere else and not be there like that." Cooper appeared to be knocked out as a cart came on the field. But the third-year receiver walked off with help from a staff member. After the game, Cooper was seen walking out of the locker room with a noticeable limp. "Anytime I throw a ball and I feel like I had anything to do with it, it rips my heart out," Carr said. "I'm not even going to lie, I had to hold back the emotions of him getting hit and thinking it was my fault. The way the linebacker played it, I had to throw it where I had to throw it. But anytime he gets hit, I feel terrible. 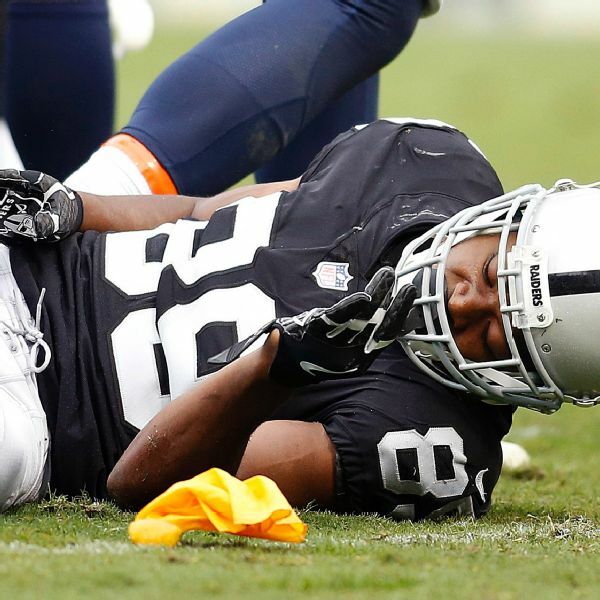 Cooper is in the NFL's concussion protocol and with an injured ankle, his availability for the Raiders' game Sunday at the Coliseum against the New York Giants is in doubt. The Raiders might also be without receiverMichael Crabtree, who is facing a potential suspension for his role in a fight with Broncos cornerback Aqib Talib. Del Rio, though, did not anticipate Crabtree being suspended. "That's for the league to decide," Del Rio said. "I would hope not. Based on what I saw, I wouldn't think there would be that type of reaction."